CarGurus has 43,138 nationwide Cruze listings starting at $999. Improved gas mileage, a turbocharged 4-cylinder powerplant, a fuel-miserly Eco trim, a capacious trunk and a pleasantly spacious cabin are but a few of the pluses offered in Chevy’s 2012 version of its compact Cruze sedan. Some things in the 2012 Cruze that need work include rear-seat comfort, a tepid automatic transmission, a dated profile and a dearth of true driving excitement. Chevrolet, thoroughly taken to task with its lackluster Cobalt sedan, has found a winner. The 2012 Cruze lineup offers everything the average family needs in a compact 4-door, including improved gas mileage, a torque-laden turbocharged 4-cylinder powerplant, a well-appointed and roomy cabin, and a ton of value. Check out the competition, but put this nifty compact sedan right near the top of your list. To the surprise of many, Chevrolet has, with its 2012 Cruze, a well-conceived compact sedan that offers decent value, popular family-oriented features, a turbocharged 4-cylinder powerplant and some surprisingly serious passenger space. Seating for 5 is complemented by 15.4 cubic feet of trunk space, while the efficient inline 4-cylinder engines, normally aspirated in the base edition and turbocharged in the higher trims, offer decent mileage and at least adequate power. Now in its second year, this little 4-door seems to have made most folks forget its less-than-perfect Cobalt predecessor. Once again available in 6 trims, the base LS, the tamped-down LT Fleet, the midlevel 1LT, the gas-miserly Eco, the upper-tier 2LT and the flagship LTZ, this compact Chevy covers just about any family sedan need. Upper trims, including the LT Fleet, carry a turbocharged four-banger, and all trims but the LTZ tote a 6-speed manual transmission that’s now standard. The top-shelf LTZ, meanwhile, still packs a standard shiftable automatic that can, of course, be loaded into any other trim as an option. 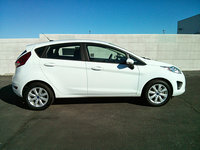 A further update for 2012 is improved fuel economy numbers in select trims. Competition for this slick Chevy compact sedan remains the Ford Focus, with its nimble moves and state-of-the-art techno-goodies, as well as Hyundai’s stylish and value-laden Elantra, Honda’s 5-star Civic and the well-wrought Mazda3. These competent rivals, especially the once-dominant Civic, are henceforth going to have their hands full keeping up with the growing popularity of the Cruze. 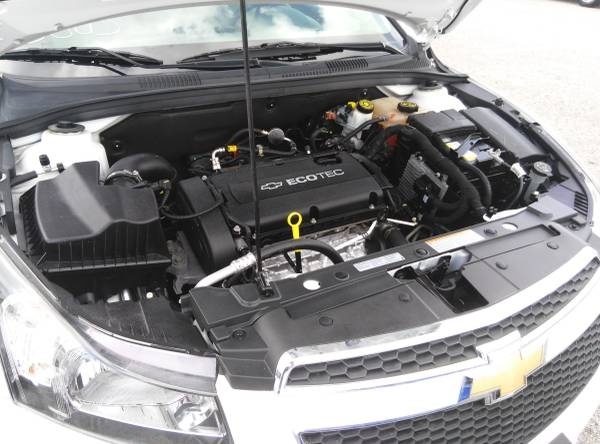 For 2012, the base Cruze LS carries a normally aspirated inline 4-cylinder engine that delivers 138 hp at 6,300 rpm and, when mated with either the standard 6-speed manual transmission or the available 6-speed shiftable automatic transmission, puts out 123 lb-ft of torque at 3,800 rpm. With variable valve timing (VVT), this four-banger is estimated at 25 mpg city/36 highway with the 6-speed manual transmission and 22/35 with the optional automatic. All other Cruze trims get the turbocharged 1.4-liter I4 powerplant, with the Eco, 1LT and 2LT editions offered with the standard 6-speed manual transmission this year. The LT Fleet, along with the top-tier LTZ, again totes the 6-speed shiftable automatic. Look for this torque-laden I4 to put out 138 hp at 4,900 rpm and 148 lb-ft of torque at 1,850 rpm, with mileage in both stick-shift- and automatic-equipped trims estimated at 26/38. Of course, the Eco, 1LT and 2LT remain eligible for the automatic transmission as an option, while the fuel-efficient Eco, boasting a smaller gas tank, svelte profile and low-rolling-resistance tires, flaunts mileage figures of 28/42 with its tweaked stick shift, and 26/39 when endowed with the automatic transmission. All trims, by the way, remain available only with front-wheel-drive (FWD). Tests of the turbo-toting 1LT had it scooting from 0-60 in 9.2 seconds, which remains about average for the class, and reviewers all but salivate over the Eco’s superlative mileage numbers. The normally aspirated I4 is noted by most reviewers, meanwhile, to be adequate for the average commuter and in errands about town, while the turbocharged version is lauded for its better merging and passing talents on the highway. Reviewers find the 6-speed manual transmission to have a smooth clutch, though some complain of an awkward shifting action. The automatic, meantime, is praised as an improvement over the 2011 edition, though a number of reviewers lament that its propensity toward fuel economy results in some lazy downshifts, with drivers forced to floor the pedal for timely shifting in full automatic mode. Both engines, though a bit noisy on hard acceleration, quiet down nicely at highway speeds, according to most reviewers. A front independent suspension is bolstered by MacPherson front struts, a torsion beam rear end and stabilizer bars fore and aft in all iterations of the 2012 Cruze sedan, while the 2LT and LTZ trims sport a sport-tuned suspension with beefier shock absorbers and springs. Reviewers claim that this sedan’s solid build contributes to a generally compliant ride, but a number of reviews note that tire size has a lot to do with ride comfort over broken surfaces. The LS, LT Fleet and 1LT roll on more forgiving 16-inch wheels, with the Eco and 2LT packing 17-inch wheels and the LTZ mounting notably less forgiving 18-inch wheels. Except for the Eco, all trims sport all-season radial tires, while the fuel-saving Cruze Eco boasts 17-inch low-rolling-resistance tires that help the fuel budget, but not necessarily ride quality. Most reviewers do concede in the end that the lower trims with smaller wheel sizes generally offer better-than-average ride comfort, and that even the higher trims with their larger wheels and tires, not to mention those trims boasting a sport-tuned suspension, will ride notably stiffer, but not to a discomforting degree. As for nimbleness, reviewers describe the Cruze as displaying an admirable steering feel regardless of tire size, with the sport-tuned suspensions reducing already minimal body lean in corners to almost nil. Tire size makes little difference in handling qualities, according to most reviews, with even the gas-friendly Eco boasting surprising sprightliness and élan. Brakes, finally, are described by virtually all reviewers as powerful and true, with a firm, confident feel to the pedal. Tests of the top-shelf LTZ resulted in a stopping distance of 122 feet from 60 mph, which reviewers call good for its class, while the Eco, with its low-rolling-resistance tires, performed equally well in braking tests. 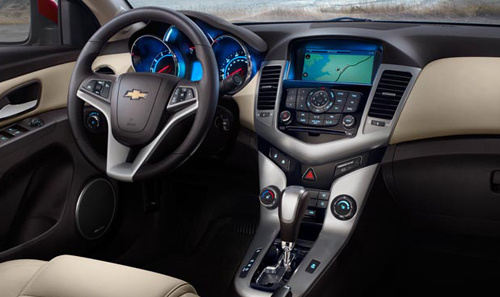 Standard features aboard the base Cruze LS include steel wheels, premium cloth upholstery, simulated alloy cabin trim, height-adjustable front seats, remote power door locks, power mirrors and power windows. A trip computer remains standard, as do telescoping tilt-wheel steering, front and rear floor mats, and air conditioning, while OnStar Directions and Connections remains bolstered by a single-CD player with 6 speakers, satellite radio and an auxiliary MP3 input. The rental-oriented LT Fleet deletes the OnStar service and adds a few extra simulated-alloy trim pieces inside, while the 1LT flaunts such standard offerings as cruise control, a leather-wrapped steering wheel mounting cruise and audio controls, Bluetooth hands-free calling and a USB port. The fuel-efficient Eco adds a rear spoiler to its profile, while the upper-midlevel 2LT boasts a sport-tuned suspension bearing heated front seats, leather-trimmed upholstery, a 6-way power-adjustable driver’s seat and a folding rear center armrest. Finally, the top-shelf LTZ sports heated power mirrors and automatic climate control that’s complemented by Sun Sensor technology, as well as remote keyless entry and ignition and an auto-dimming rear-view mirror. 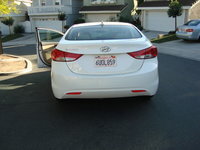 Of course, rear parking sensors and premium interior trim accents also remain standard on this flagship trim. As is traditional, lower trims in Chevy’s cool Cruze lineup are eligible for a number of items, including the RS Package’s unique front and rear fascias and rear spoiler (standard on the LTZ). The 1LT, furthermore, can be delivered with an available All-Star Package that boasts a power sunroof and 9-speaker Pioneer premium audio system, while the 1LT/Eco Driver Convenience Package offers remote start, remote keyless entry and ignition and rear parking sensors. Finally, the 2LT and LTZ trims can be fitted with an available hard-drive-based navigation system boasting a 7-inch touchscreen. Reviewers find the 2012 Cruze to be admirably well-equipped for its price level. Comfortable front seats are balanced by adequate, if not capacious rear-seat room, while interior materials and workmanship rival those of class leaders. Virtually all reviewers note that the somewhat small doors make for difficulties in entry and exit, while the surprisingly spacious trunk is compromised a bit by the intrusive sickle-style hinges. Interior small-item stowage is adequate, note most reviewers, but not exceptional. The 2012 Cruze may be small, and it may be inexpensive, but it still packs a ton of standard safety features. Four-wheel antilock brakes boast electronic brakeforce distribution, and it all comes standard across the lineup, with traction and stability control complemented by quad front and rear side-mounted airbags, as well as front and rear head airbags. Daytime running lights remain standard lineup-wide, as do dusk-sensing headlights, a post-collision safety system that’s bolstered by OnStar safety alert apps, and a remote antitheft alarm. The LTZ again carries standard front fog/driving lights that are optional for the 1LT and higher trims when the available RS Package is selected. For 2012, Chevy’s value-laden Cruze sedan again flaunts award-winning safety scores in government and insurance industry testing. For instance, the National Highway Traffic Safety Administration (NHTSA) gives Chevy’s compact sedan 5 stars, its highest rating, for overall safety, front impact protection and side impact protection. Rollover testing, meanwhile, garnered the Administration's second-highest 4-star rating. 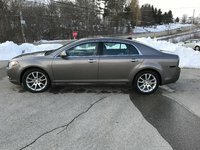 The Insurance Institute for Highway Safety (IIHS), meantime, awards the Cruze a Top Safety Pick for 2012, with this nifty 4-door gathering the Institute's highest score of Good in all testing criteria, including front and side impact, roof strength, dynamics and seat/head restraint configuration. The 2012 Cruze lineup, while well-received overall, gets some low marks from owners for its perceived styling faux-pas and issues with build quality and reliability. Seats, especially in the rear, are panned by a number of owners for poor long-haul comfort, while others feel that the I4 engines leave a bit to be desired, power-wise, and could use a V6 compatriot. Finally, a number of owners are displeased with the control arrangement in this compact sedan, while others complain that a number of features that are traditionally included with autos in the Cruze’s price range remain unavailable. 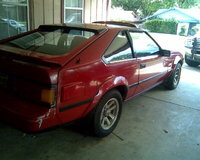 On the plus side, owners laud those standard features that do come standard in this compact Chevy, while a good feel to the wheel, the quiet efficiency of both I4 powerplants, especially the turbocharged editions, and the extraordinary mileage numbers from the normally aspirated four-banger continue to impress. Finally, stellar safety scores and decent ride comfort once again contribute to the above-average approval ratings given this well-wrought compact Chevy by a vast majority of owners. What's your take on the 2012 Chevrolet Cruze? Users ranked 2012 Chevrolet Cruze against other cars which they drove/owned. Each ranking was based on 9 categories. Here is the summary of top rankings. 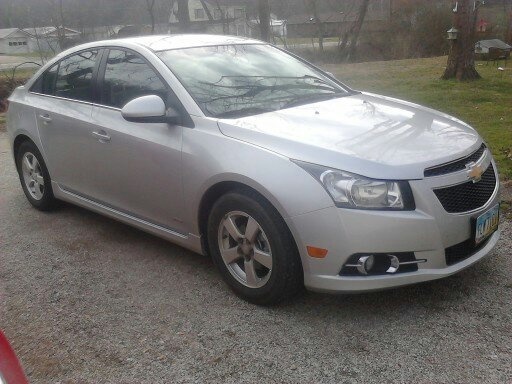 Have you driven a 2012 Chevrolet Cruze? What Type Of Gas Does The Chevy Cruze Lt Need? Premium Or Regular ? I locked my keyless entry keys in my trunk, I'm asking if there is an actual keyhole in my driver side door because I can't find it?